A mountain climber is dead after a slab of granite being described as the size of an apartment building broke off the monolith known as El Capitan near a popular climbing route in Yosemite National Park on Wednesday, Sept. 27. “A 100 foot by 100 foot piece of El Cap just fell off directly above WaterFall Route,” Canadian climber Peter Zabrok wrote on Facebook shortly after the incident. The National Park Service has confirmed the fatality but has yet to release the name of the fallen climber. Zabrok wrote that a first responder was soon helicoptered in and three enormous rock falls followed the first one. “This rescuer is in tremendous peril,” wrote Zabrok. Rangers from the park say the rockfall was of “undetermined size” and confirmed it fell from the “Waterfall Route,” a popular climbing route on the East Buttress of El Capitan, where Horsetail Falls flows in spring and winter. “Yosemite National Park Rangers and Yosemite Search and Rescue are currently on scene assessing the situation. The park helicopter is currently flying and also assessing the situation,” the park said yesterday. Zabrok captured the moment a rescue helicopter came in, staring down at it from the cliffside directly overhead. Park officials transported the injured person outside the park on Wednesday to receive medical care. “This is the climbing season in Yosemite National Park and there are many climbers on El Capitan and other climbing routes in the park,” said the park service. The National Park Service has said it will issue an updated release Thursday morning. Calls to the National Park Service were not returned by publication time. There were about 30 climbers on El Capitan when the rock came down around 2 p.m., reported the Los Angeles Times. 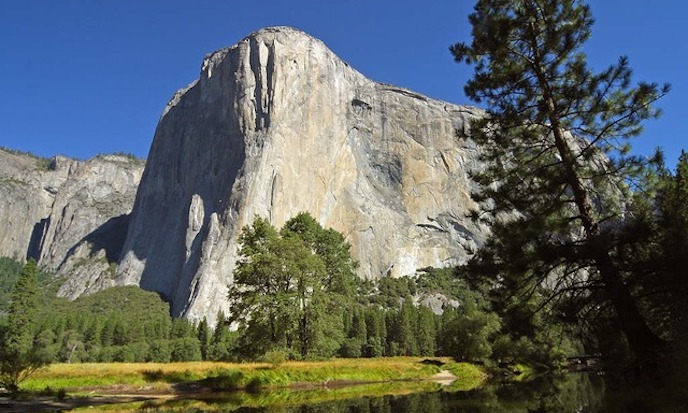 El Capitan draws climbers from around the world. The granite monolith reaches 3,000 feet above the valley below, a beacon to base jumpers looking to launch over the valley below. The sheer granite face is an alluring challenge for climbers—the routes from the base to the summit are known and named: The Big Chill, Sea of Dreams, and The Prophet. It is one of the most difficult climbing areas in the world. Earlier this year, Alex Honnold made international headlines when he became the first person to climb the rock face without a rope. Video of the terrifying climb went viral and Honnold later appeared on late night talk show “Jimmy Kimmel Live” and was featured by National Geographic.